The statistics are striking: In a 2014 analysis of 3,500 children’s books published in the United States and Canada, just 11 per cent were about non-white characters and only 8 per cent were written by non-white authors, according to the Cooperative Children’s Book Center at the University of Wisconsin-Madison. via How the publishing industry is addressing the need for diversity – The Globe and Mail. CILIP, the library and information association, has announced plans to include an independently chaired review of the CILIP Carnegie and Kate Greenaway Medals as part of the organisation’s wider Equality and Diversity Action Plan. CILIP is due to publish its Equality and Diversity Action Plan, led by the CILIP Ethics Committee and the Board of Trustees, in the summer of 2017. The Plan is as a result of on-going work, following previously published research commissioned in 2015 by CILIP and the Archives and Records Association, which outlined diversity issues in the library, archives, records, information management and knowledge management sector, including a gender split in the workforce of 78.1% female to 21.9% male (UK workforce 50.1% female and 49.9% male) and that 96.7% of the workforce identify as ‘white’ (UK workforce 87.5% identify as ‘white’). CILIP’s Action Plan will identify steps in both the short and long-term to improve and champion equality and diversity within CILIP, its governance, membership and the wider library and information sector. It will now include details of the review process for the Medals. The decision to hold an independently chaired review of the CILIP Carnegie and Kate Greenaway Medals was taken by CILIP and the Working Party who plan and develop the Medals, following concerns raised about the lack of BAME representation on the 2017 Carnegie Medal longlist announced in February. The review will inform the annual evaluation process and long-term planning around the Medals and accompanying shadowing scheme. The review process – which will provide recommendations about how diversity, equality and inclusion can best be championed and embedded into its work – will be open, transparent and accountable and will proactively seek views and contributions from the widest possible range of stakeholders. The review will begin following the announcement of the 2017 winners in June and follow the 2018 prize cycle. The shortlist for the 2017 CILIP Carnegie & Kate Greenaway Medals will be announced on Thursday 16 March 2017. The winners of the Medals, and the Amnesty CILIP Honour (which commends human rights in children’s literature), will be announced on 19 June 2017. I hadn’t previously been to the Centre for Literacy in Primary Education aka CLPE, which is surprising given my background in both education and books. How heartening that such an organisation has managed to buck the trend of closed services and inservice training centres – not only to survive but to flourish. If the quality of the day conference I attended yesterday is typical of events and training days CLPE organises, I am not a bit surprised that schools are, at least for now, willing to spare cash from their strapped budgets to allow teachers out for the day and benefit from such programmes. The cost of peak rail fares probably limits attendance to those working in schools in the London area, which is a shame, because, especially with the diminished role of local authorities in organising training courses and the closure of all but a small number of teacher centres, an event such as the one organised today would have so much to offer teachers further afield. Shifting the start and end times of the day forward by one hour might help attract those who are able to reach London for 10:30/11:00 on off-peak fares. CLPE’s own Learning Programme Leader, Farrah Sarroukh, argued in her opening address that, in the context of both Brexit and the Trump presidency, the emphasis in teaching literacy needs to be somewhat more positive than merely encouraging ‘tolerance’ – much more important is empathy, and an understanding acceptance of difference (throughout the day there was a commendable effort to refrain from jargon and the use of too-frequently-tripped-out terminology – as in the avoidance, where possible, of the overused word ‘diversity’). Cue the first keynote speaker, Miranda McKearney OBE, founder of both the Reading Agency and the Summer Reading Challenge. McKearney retired from the Agency when she turned 60 but, after a brief spell trekking in foreign parts, found herself compulsively researching recent studies into the effect of reading on the brain. This led to her setting up EmpathyLab, the subject of her talk. The second keynote speaker was author Elizabeth Laird who used personal anecdote, family snaps and photographs from her travels to give the audience an insight into the way authors collect bits from their past and use brief encounters on overseas research trips to put the elements of a novel together. She did this with particular reference to her latest book Welcome To Nowhere. Floella Benjamin spoke (and sang) with powerful passion about her experience of moving to England from the Caribbean. Her father, a jazz musician, was the first to make the trip, later joined by their mother. Losing the loving presence of her mother had a shattering effect on Floella, who had to spend fifteen months separated from her siblings and living with a cruel and authoritarian ‘aunt’ and ‘uncle’. Finally arriving in England, the reunited family lived in a single room in Chiswick. Floella sufffered frequent racist abuse, but gave as good as she got, often responding physically. Indeed, the way the 67 year old squared up to her audience in boxing mode, fists ready to fly, gave a pretty clear indication of how intimidating her angry responses to those who dared slur her must have been. She is still getting her own back. When the family moved out of their single room and were able to buy a house in Beckenham the racist abuse continued. Her mother stayed on in that house for 40 years undaunted by the antipathy of some. Now Floella is proud of her full title, Baroness Benjamin of Beckenham, the sweet irony of which she is pleased to enjoy on her mother’s behalf. She called the assembled teachers ‘chosen ones’ who must not let a single one of the children in their care feel unloved. After a really excellent buffet lunch (five-star conference fare) the delegates split into four workshops, each of which allowing for greater activity and participation than in the morning sessions. The day ended with a question and answer session featuring two directors of Letterbox Library (booksellers for the conference) and Verna Wilkins (original founder and publisher at Tamarind Press, and now of Firetree Books). The whole day was wrapped up by CLPE’s Chief Executive Louise Johns-Shepherd. In the months since the book has been published, objections to its depiction of the slave characters have emerged. In August, one librarian pointed to its “misleading depiction of slavery”. The criticism has since swelled, prompting Jenkins to issue an apology on the Reading While White blog, a site run by white librarians with the intention of confronting racism in children’s literature. The site had said that “no matter how thoughtful the intent was in depicting this mother and child, the end result is that it can be seen as perpetuating painful imagery of ‘happy’ slaves”. In a note in the book, Jenkins says that she included slaves “even though there is by no means space to explore the topic of slavery fully” because “I wanted to represent American life in 1810 without ignoring that part of our history”. But she wrote on the Reading While White blog this weekend that she had read the discussions about her book “with care and attention”, and that “I have come to understand that my book, while intended to be inclusive and truthful and hopeful, is racially insensitive”. Serving at the dinner table, meanwhile, the scene is “set up to show the deep injustice of the situation”, and the mother and child are “sombre and downcast”, while children have responded “most viscerally” to the image in which the mother and daughter hide in the cupboard to lick the bowl. via Children’s author sorry for ‘racial insensitivity’ in picture book showing smiling slaves | Books | The Guardian. As an illustrator, I want to see a variety of people in illustrations, and see people push their drawings further to be… not just diverse and inclusive (which is hugely important) but… interesting. 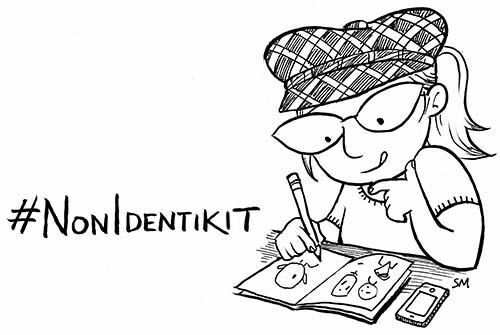 via Putting More Diversity in Comics and Illustration: Why I’m Taking the #NonIdentikit Challenge | Sarah McIntyre. So thinking and wondering about all this, I’ve set myself a challenge: Draw 20 female faces that don’t fit this identikit model but are still striking or beautiful. Arresting enough that if I saw them in the street, I’d turn around and think, WHOA! Faces that aren’t standard Hollywood ingenue or female superhero, but I can’t stop looking. Sometimes they’ll be from non-white ethnicities, sometimes they’ll be the white teenager or 20-something women that illustrators I know seem to prefer drawing, but with a difference. A heavier chin, a big nose, a monobrow, at least one variation that we get in real life. 2. Study old master drawings and adapt portraits to suit your own modern taste. 3. Just experiment a bit. Here are a few snapshots of experimental #NonIdentikit sketches I’ve already posted on Twitter, and a few other people have already jumped in to try their own. held as part of the Children’s Bookshow. Two sessions with practitioners who make translation mainstream. Hahn began by promising “an unstructured conversation” about publicity and marketing. The panel had quite a lot to say on the subject and there was only time for a couple of questions from the floor. After David Fickling had confessed to a certain sense of guilt in the largely one-way direction of ‘publishing to the world’ I had wanted to ask about the dynamics of marketing a proposal to publish a work in translation. Who is most active in this regard? Is it the author’s agent, the author’s foreign publisher’s rights department, the translator, a reading scout? It’s something I have no idea about. Are international book fairs the main movers and shakers in this regard, or are books in translation likely to originate in other ways? A question directed at the second panel covered similar territory. A translator asked the Arts Council representative to imagine a scenario: if she the translator were to find a book in a language that was under-represented (an Arabic book from North Africa, for example) but was unable to persuade any publisher to take it on, would it be worth applying for Arts Council support. The response was that such support would normally only be given to a recognised publisher in whom the Arts Council would have confidence in seeing the project delivered. But the questioner was told would be worth a try, to see if normal rules of engagement could be bent. I’d be more interested in discovering how translated books that get published in English with NO Arts Council support come into existence. Sam of bsmallpublishing had a very practical mercantile approach. For him it was a straightforward case of ensuring a publishing project made money. He had some interesting observations about Twitter. Because MFL (modern foreign language) teaching has become mandatory in primary schools and because bsmall has many dual language titles on their list, teachers are often referencing them in their tweets at 11 o’clock at night. Does he respond there and then when he’s supposed to be at home relaxing or wait until the morning when he’s back at work but when the teachers will also be in their classrooms and far less likely to be on Twitter. I found Graham Henderson of Poet In The City a very switched on member of this panel, with interesting things to say about the new synergy between traditional print publishing and the digital, online world. In his view it’s not about a cut-throat battle between real books and ebooks. It’s much more a question of how, especially in a world where review space in the print media is declining, online activities and interaction (Twitter, Facebook, websites) can be used to alert the audience to good literature and events. Just when the panel seemed to be meandering, Fusek Peters jumped to Boyd Tonkin’s aid and read a few translated poems aloud, including one from the Czech which he had translated with his mother and read first in the original language and then in English. Earlier I had been to the Edward Steichen exhibition at the Photographers Gallery, taking advantage of free admission between 10:00 -and 12:00. Marvellous as it was (and I shall certainly try and return for a second visit before it closes in January) I have to say I was transfixed by the fashion/art sliding slideshow on the top floor of work by Viviane Sassen. In some ways the Steichen showed the limitations of a traditionally print-framed exhibition. The photos are no more surprising and have no more impact on the wall than they do when reproduced in a book. This is not usually the case with painting. There is nearly always an element of surprise in seeing a painting ‘in the canvas’ so to speak, when previously you have only experienced it as a print in a book or as a digital reproduction on a screen. Where galleries can excel in exhibiting photography is in a sense of size and dimension – displaying imagery on a grand scale, which is exactly what the Sassen show does. The slideshow lasts for a full 45 minutes. I stayed until I was sure I’d seen every image in the loop. Daniel Handler incited fury within the literary community for the offensive jokes he made at the recent National Book Awards ceremony. Handler, who served as the master of ceremonies, has publicly expressed remorse for those remarks and found a way to make amends. Handler (pictured, via) revealed on Twitter that he plans to contribute $10,000 to the We Need Diverse Books Indiegogo campaign. For the next 24 hours, he will match whatever donations come in up to $100,000. via Daniel Handler Contributes $10K to the We Need Diverse Books Crowdfunding Campaign – GalleyCat. Included in GalleyCat’s post about this are all Daniel Handler’s tweets on the subject of his remorse…. Thanks to Seven Stories, The National Centre for Children’s Books for sharing the list with us today – and to the experts they called on to pull it together: Julia Eccleshare (the Guardian children’s books editor), Jake Hope (from Youth Libraries Group), Library specialist Sarah Smith and Katherine Woodfine from the Book Trust. via Diverse voices: the 50 best culturally diverse books | Children's books | theguardian.com.